PLEASE DO NOT SEND ANY EMAILS WITH NEGOTIATIONS OR LESS-PRICE OFFERS! Arkadi Rusin was a well-known artist who lived and worked in the city of Odessa at the Black Sea. He studied in Odessa and at the St. Petersburg Repin Institute of Art. Condition: In good overall condition; framed. Measurements: UNFRAMED:40,5x27,0cm/15,9x10,6in FRAMED: 51,0x37,0cm/20,1x14,6in. Object Type: Framed oil painting. 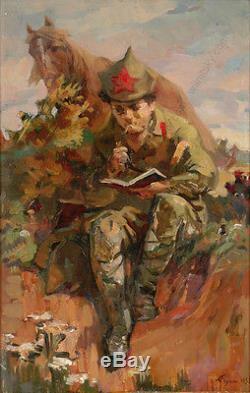 Inscription: signed in Cyrillic, dated 1952. 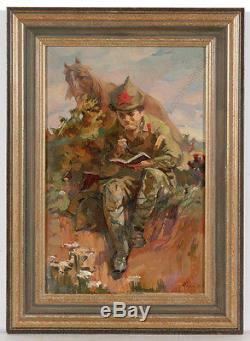 Themes: RUSSIAN UKRAINIAN SOVIET SOCIALIST REALISM READING HORSE YOUNG MAN SOLDIER ARMY WAR RUSSIAN CIVIL WAR RESTING. Sometimes more, depending on destination.